The rest of the world knows what's going on. Take, for example, Germany, which is now far more of a leader of "the free world" than Trump's American dystopia. Once upon a time, it was America going to war against German fascism. My, how the roles have reversed. 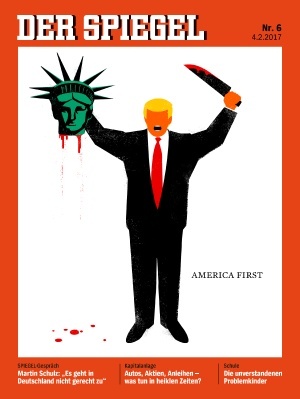 It may not be a war, yet, but Germany is certainly on the side that is fighting American fascism. Yes, the great threat to America is Kim Jong-trump, the orange-tinted demagogue roaming the White House in his bath robe. We know what's going on. From a Yahoo! / Live Nation broadcast, here are Steven Wilson and his awesome band performing "Home Invasion" and "Regret #9," two songs that work as one, both on Wilson's 2015 album Hand. Cannot. Erase. (to me, the Dark Side of the Moon of our time, and, like Pink Floyd's masterpiece, one of the greatest albums ever made -- perhaps the pinnacle of Wilson's career so far, including his time with Porcupine Tree), at The Wiltern in Los Angeles on June 13, 2015. I saw Steven Wilson in Toronto on that tour, and "Regret #9" was certainly one of the highlights of what was a truly incredible show from start to finish. The back-to-back keyboard and guitar solos by Adam Holzman and Dave Kilminster, respectively, were simply astonishing, as they are here. The problem with running a campaign based on channelling voters' grumpy old man is that there is always a possibility of being out-grumped. This seems to be happening to Sen. Ted Cruz who, according to a new poll of insiders by Politico, is suffering the most from Trump's unlikely recent success. Insiders say ... Trump ... is as uncompromising as Cruz on hot-button issues like immigration - and can deliver the message with even more fiery rhetoric," by Katie Glueck: "Roughly a third of Iowa and New Hampshire Republican insiders pointed to Cruz as the candidate who is damaged the most in their states by Trump's rise in the polls. [An Iowa Republican:] 'Cruz, the incumbent proxy for the disaffected GOP "Hell No!" Caucus, has been virtually starved of oxygen since Trump entered the race.' ..
Sure, Trump is a jerk, and having to endure his enhanced celebrity status is annoying, but just for today I am going to take some pleasure in how unhappy it must be making Ted Cruz. The enemy of my enemy is a temporary source of satisfaction.